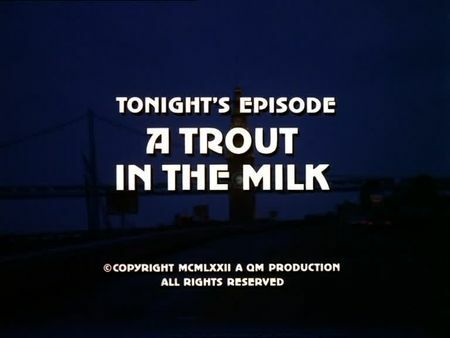 The screencaps for A Trout in the Milk were added to the episodes' page. The very difficult family connection between Yale Courtland Dancy, an eccentric and renowned poet, philosopher and bon viveur, and his daughter, Genea, gets stirred when a painting artist for whom Dancy's daughter acted as a model falls from the window of his studio and eventually dies. A great many of suspects ranges from competing street artists, models, fancy women and the likes, and our two cops soon have a lot of tracing work to do as Dancy - with an obvious antipathy against the late painter - is not as cooperative as Stone and Keller originally assumed. Actually, this one belongs to my favourite season one episodes (location- and script-wise) as it gets across much of the typical San Francisco atmosphere of the early 1970's. This episode takes us through North Beach, including Washington Square, over to a street artist market at Justin Herman Plaza across from Ferry Terminal with Villaincourt Fountain and elevated Embarcadero Freeway in background (nice aerial view from the upper levels of the Hyatt Regency hotel). We are also taken to the City of Paris fashion-store at Union Square and the Japanese Tea Garden in Golden Gate Park, ending-up on a ferry right beneath Bay Bridge. Furthermore, an indoor-sequence was filmed at SF General Hospital.